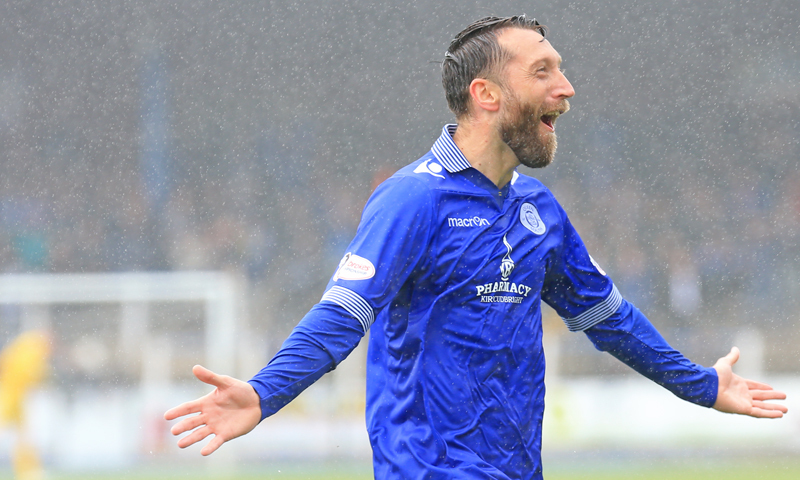 Two wonderful strikes from Stephen Dobbie guided Queens to a second successive win as they climbed into third place in the Championship table with victory over Falkirk. 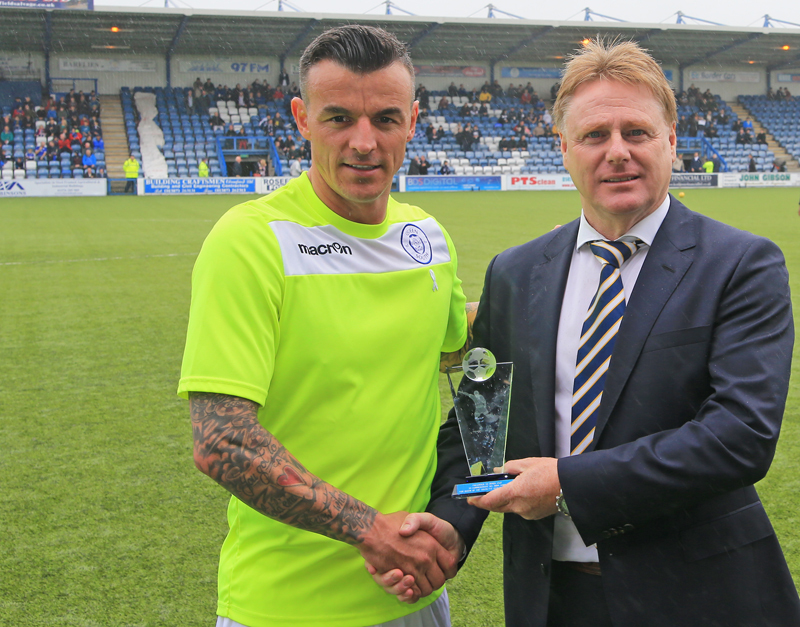 In a game largely dominated by the visitors - especially in the opening half - two fantastic strikes from Dobbie lit up Palmerston as the striker showed that he has still retained his ability to do something special.Before kick-off Derek Lyle was presented with a momento to mark his 300th appearance for the club,the milestone being reached against Ayr last weekend. Queens made just the one change to the team that started against Ayr last time out with Mark Millar coming into midfield in place of Callum Tapping. Starting in the favoured 4-4-2 formation with Dobbie and Derek Lyle up front, it took Queens sometime to get into the game whereas the visitors were quickly into their passing game and looked to press their hosts from the outset.Their midfield trio of Sibbald, Rankin, and former Queens man, Mark Kerr, took an early control of the game, and good work from Sibbald set up a chance for McHugh who saw his shot pushed for a corner by Lee Robinson. With Queens being pushed back in the early stages there was little opportunity for either wide men, Grant,or Dykes, to get themselves involved in the game and in an effort to change this, they switched sides to try and unsettle what was looking to be a confident visiting defence and it almost worked straight away as Dykes nearly got in behind Leahy but the defender just recovered in time. 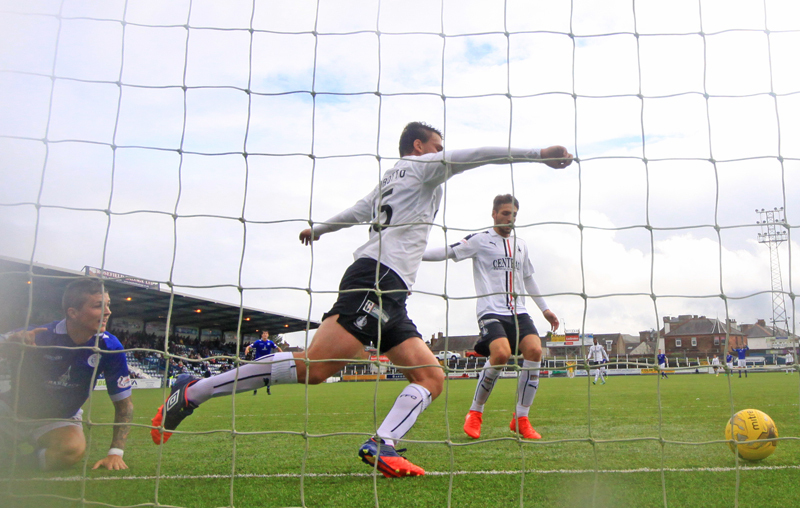 Queens won themselves their first corner of the game 17 minutes in and after Jamie Hamill`s short set-piece found Dykes his pass almost freed Dobbie but Muirhead came across to clear. That was better from Queens and moments later when the break of the ball went in their favour, Derek Lyle appeared to be in on goal but more good defending saw the ball cleared for another corner. This time Hamill elected to go long with his kick trying to pick out Darren Brownlie at the far post and once again good defending, this time by Watson conceded a second corner in quick succession. 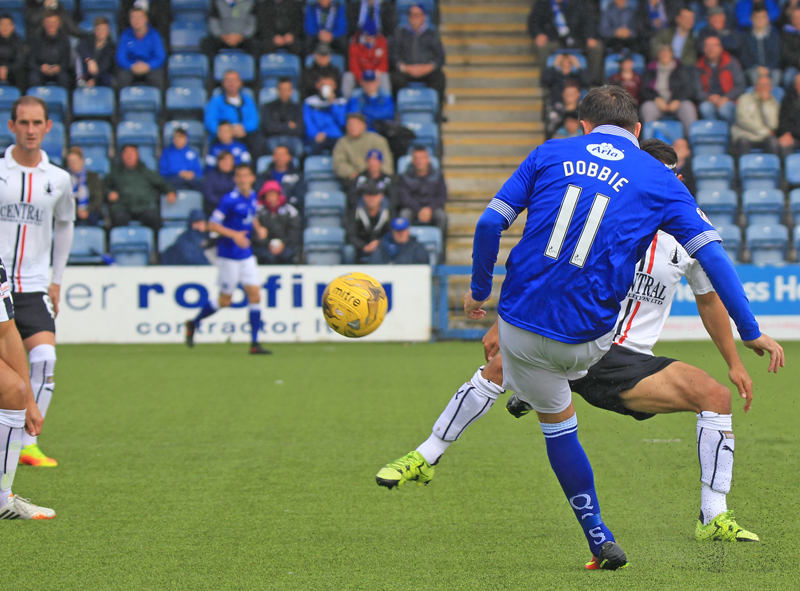 This time, from the left, Hamill`s inswinging delivery reached Brownlie but he could only direct his header wide of the target. Falkirk continued to look dangerous when they attacked, and with both McHugh, and the lively John Baird up front, the Queens defence were constantly being dragged around, and the two former Queens players combined well to create a chance for McHugh who dragged his effort wide of goal from just inside the area. Although Mark Millar, and Kyle Jacobs were outnumbered in the middle of the park, they slowly began to get more involved in the game, and Jacobs tenacity, and strong running seemed to allow him to be in the right place at the right time, either winning back possession, or tidying things up for his team, and in fact it was Jacobs strong play that began what was Queens best chance of the game so far.After winning the ball in midfield, Jacobs nicely weighted pass allowed Hamill to cross first time, and although not known for scoring many goals with his head, Dobbie got ahead of the defence but could not keep his header on target. It was to be a different story just four minutes later as Queens took the lead with a stunning strike.There seemed to be no danger for the Falkirk defence when the ball broke for Queens some 25-yards out, but Stephen Dobbie had other ideas as he moved on to the ball and casually curled in a superb strike that flew past `keeper Rogers who was beaten by the sheer accuracy of the shot.It was simply a brilliant effort and well worth the entrance fee just to witness it. Although the goal came slightly against the run of play, the visitors failed to let it put them off of their game plan,and almost immediately they had a big chance to get themselves back on level terms.A cross was headed down into the path of Baird by Gasparotto, but on the half volley the striker lifted his shot over the bar, although a corner was given so presumably it was deflected over the bar. The visitors continued to press and almost gained parity just before the break but Lee Robinson was at his best as he saved well from Muirhead`s stinging drive . That was the final action of the half and although the home side were a goal to the good, it was the visitors who had played the more constructive football, and they would have been disappointed to have been behind at the break. The second half was just five minutes old when Palmerston erupted again, and most of the 1841 in attendance were delighted at what they had just witnessed. 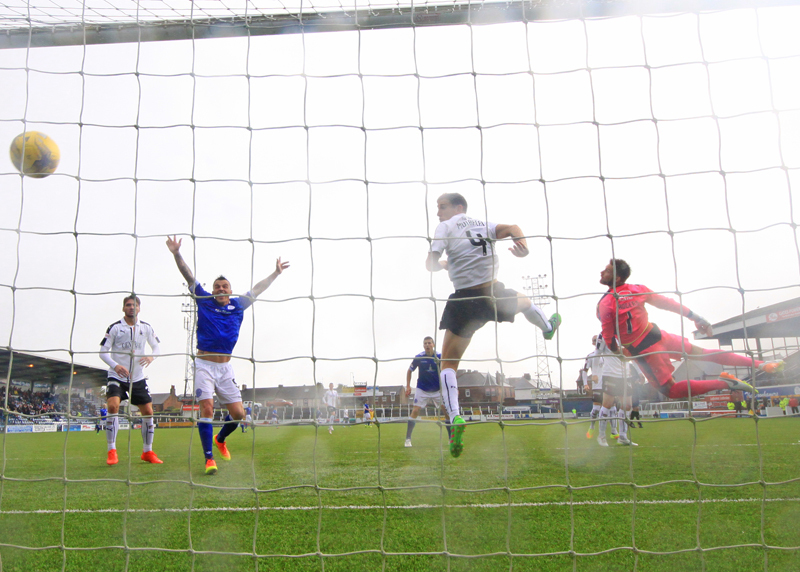 Having scored what was a contender for goal of the season on 34 minutes, Stephen Dobbie was at it again. When the ball fell to him inside the penalty area on the angle of the six-yard box it seemed as though there was no route to goal as defenders and `keeper appeared to have the goal covered, but once again he had other ideas and his delicate chip was high enough to go over both defenders and `keeper but low enough to dip under the crossbar and give Queens a real chance of claiming all three points. Dobbie has scored many goals as a Queens player - 59 in fact, but I doubt that he has ever scored two of such high quality in the same game. 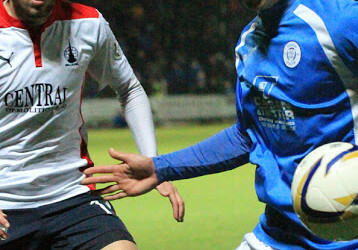 Queens had switched their formation to a 4-2-3-1 set-up and as a result were denying Falkirk any space in midfield, and as a consequence the second half was slightly more even, although the visitors were still able to create chances and even being 2 goals behind they were still very much in the game. 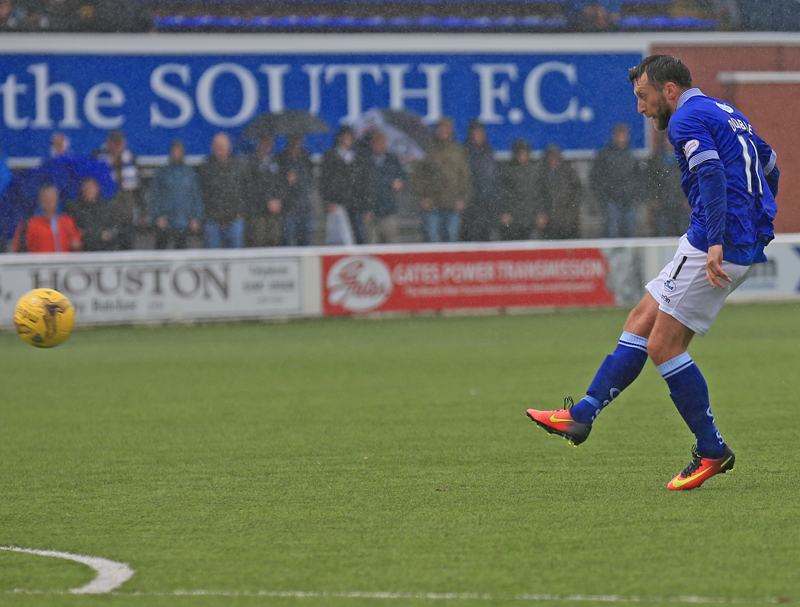 Lyndon Dykes and Stephen Dobbie seem to be forming a decent understanding already and the pair linked up well before Dobbie tried to pick out Derek Lyle in the area, however his cross was not quite accurate enough. Minutes later Dykes was sent clear by Lyle`s flick and with only the `keeper to beat he was unable to finish as he had done last week as the on-loan Aberdeen `keeper stood his ground and saved well. It had been a quiet afternoon for Lyle who was of course looking to score his 100th goal for Queens, but after taking a knock earlier in the half he succumbed to the injury and was replaced by Dale Hilson. So not today for Lyle, but I am sure THAT goal is not far away. Falkirk substitute Miles Hippolyte is the possessor of a long throw and on the hour mark his delivery caused a certain amount of panic in the home defence, but thankfully when the ball fell for Gasparotto, he slammed his shot wide of the post. With Dykes playing through the middle as the lone striker, Queens were starting to dominate play, and the Australian almost added goal number three when heading Hamill`s cross only just wide of the target. Dale Hilson`s first meaningful action of the game saw him become the first player to be cautioned by referee, Kirkland, pulling back Hippolyte as he threatened to break clear. From the resulting set-piece Kerr`s delivery was met by Gasparotto`s powerful header but Robinson was alert enough to tip the ball over. Lyndon Dykes was cautioned minutes later after being somewhat harshly penalised for a foul, he protested too much and was shown yellow for dissent. The points should really have been well wrapped up moments later when Dobbie`s perfectly weighted pass sent Grant Anderson clear but Gasparotto got back well to deny Anderson his first Queens goal at Palmerston.Jake Pickard replaced Mark Millar for the final few minutes, and then Lee Robinson became the third Queens player to be booked after a clash with - who else ? - Baird, but it appeared that Robinson was just trying to calm Baird down rather than wind him up, but the official had a different view and Robinson was shown yellow. With six minutes left the cake was very nearly iced as Dobbie went very close to completing a hat-trick, after turning inside his low left foot drive from just outside the box didn`t miss the target by all that much as `keeper Rogers scurried across his goal. Queens had gone close to adding a third goal on a couple of occasions but only Lyndon Dykes will know how he failed to knock the ball home from just 6 inches out. Dale Hilson`s run and shot drew a smart save from Rogers but as the ball ran away from the `keeper Dykes only had to connect to score but somehow he mis-kicked the ball and although it was moving towards the line there was not enough power to take it over. Stephen Dobbie was replaced by Owen Moxon right on full-time and as you would expect, he left the field to a standing ovation from all of those of a Queens persuasion.Not surprisingly Dobbie was named as man-of-the-match - which seems to be becoming something of a norm- however he was well supported again by his team-mates especially in a very good second period. 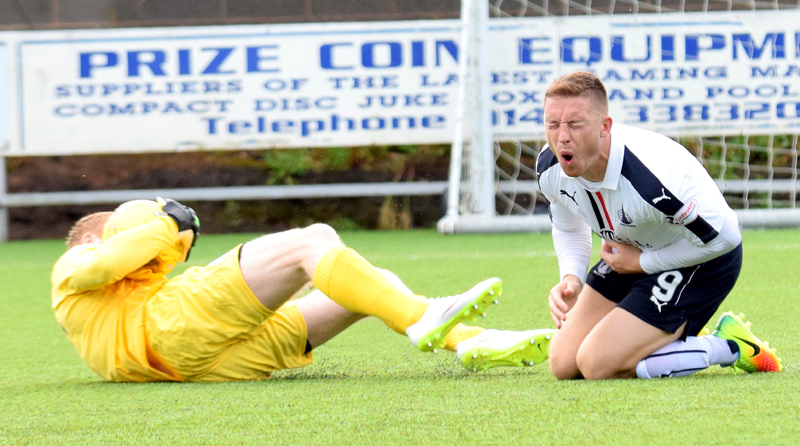 Queens will take their unbeaten league start to Dunfermline next weekend where it will be another game against a former manager, as well as former colleagues. Hopefully the run can continue. 14:32 Falkirk; Rogers, Leahy, Muirhead, Rankin, Taiwo, Kerr, Baird, Sibbald, Gasparotto, McHugh, Watson. 14:34 One change for the Doonhamers. Mark Millar returns from injury and replaces Tapping in the starting XI. Dale Hilson makes the bench. 14:58 The team`s are out and we are moments away from kick-off. 7 min Even start here, with no real chances to report on. 11 min Baird is fouled by Brownlie on the left. Rankin whips in a free-kick but Robinson collects. 12 min Robinson pulls off a fantastic save to deny McHugh from 20 yards. 17 min Marshall whips in a cross, Anderson heads it goal bound but is cleared by Watson. 19 min Baird wins a free-kick on the right as Dowie clips the ex-Queens man. 22 min Lyle wins the ball and hits the ball off Leahy for a corner. 31 min Hamill crosses into the box and finds Dobbie but he heads wide. 35 min What a goal. 36 min Anderson crosses into the boss and with Dobbie lurking the Bairns put it out for a corner. 36 min Dowie leaps the highest but heads over the bar. 1-0 Queens. 38 min Ball falls to Baird but his close-range shot is deflected out for a corner. 44 min Sibbald plays in Muirhead on the left but his shot is tipped out by Robinson. 46 min Hamill`s cross-come shot is caught by Rogers. 51 min Rankin skies his attempt over the bar. 54 min Marshall`s deep cross finds Anderson but is straight at the `keeper. 61 min Glorious chance for the visitors to get one back but Gasparotto misses from six-yards out. 64 min Dykes beats the offside trap but his shot is saved by Rogers and hit out by a defender for a corner. 66 min Ball in from the right and Dykes heads just wide. 69 min McHugh scuffs a shot straight to Robinson. Still 2-0 here. 72 min Hilson booked for a tug on Hippolyte`s shirt. 73 min Gasparotto`s header is tipped over by Robinson. 75 min Dykes booked for dissent. 77 min Dobbie plays the ball to Anderson on the right and his shot goes out for a corner. 78 min Dykes is fouled just outside the box. 79 min Dobbie whips in the free-kick to the advancing Brownlie but he hits the side netting. 82 min Robinson tips Gasparotto`s header over. 89 min Hilson`s cross is saved and Dykes nudges it but is blocked on the line. 89 min Dykes` header is saved by Rogers. 90+1 min Leahy blasts an effort inches wide from the edge of the box. 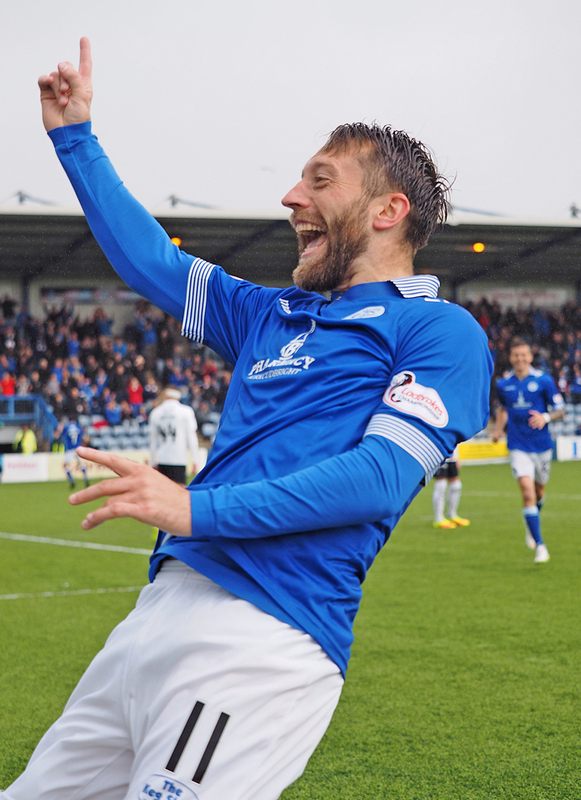 90+3 min Sponsors choice man of the match is number 11 Stephen Dobbie.